Well, it’s almost with a heavy heart that I unleash this on you. A few months back a lovely man called Charles emailed me a link to a site that was hosting over 500 North Korean films for download. At around US$2 each. So there. I faced it. The reality of chasing down copies of North Korean films off dodgy Russian torrent sites, the awesome people I meet on the comments board of this site, has become needless. The internet is an amazing place, but I just miss the days when you could trawl around looking for things for days/weeks/months and not find it. Now it’s all here under one roof. 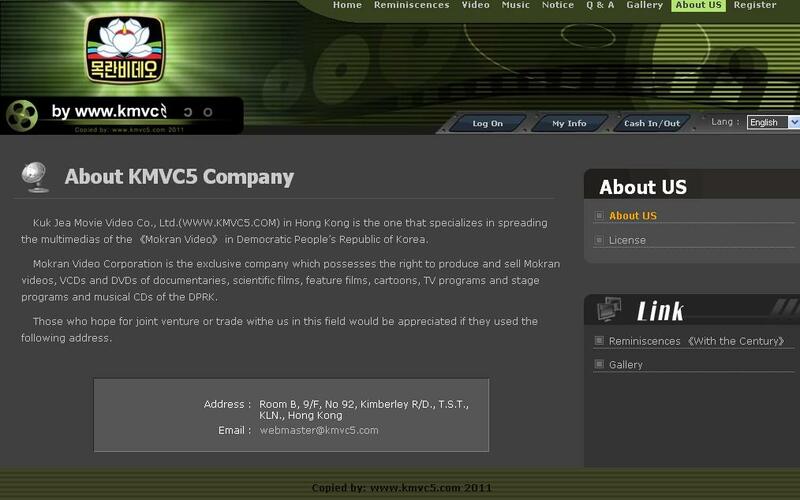 So Hong Kong company KMVC5 (and they’ve made it even easier by giving you the option to put it in English) representing Mokran are offering you the best chance to get hold of literally hundreds of hard to find North Korean Films, cartoon, performances and documentaries. So go there. Watch movies and let me know about them. In the meantime, I’m going to watch this YouTube clip of a Mokran factory in North Korea making DVDs. What an absolute banging soundtrack. Not sure about that, I’m afraid. I guess the best place to start would see if anyone wanted to fan-sub it. Perhaps we can rally support. Or maybe even a kickstarter campaign to fund it? I was thinking of that to get some South Korean books about DPRK films translated. I think it is very difficult to find a translator, I was hopping that the authorities already had translated the Nation and Destiny series, as they contain a lot of interesting historical viewpoints, explicit ideological messages, emotional stories, and famous actors and characters. Yeah, we need them on there. Do you happen to speak Korean? Perhaps you can help with the next post I’ve got coming up. Sorry for the late reply –been busy on and off work for the entire month. My Korean speaking skills have deteriorated, but I’m still pretty good with my reading. Feel free to hit me up by e-mail, and I’ll try to find some time to help out in any way possible. Thanks for the link. What about these 50- and 60-part movies? Are these the longest films ever made? I think they’ve got to be the longest running series of films… or could they be clased as “serials”. Or does the James Bond franchise have an answer for us. I guess that’s my question. Do these fifty-part films tell one, continuous story or do they simply deploy the same set of characters in different situations (like the Toru-san series)? The Bond films is a series of separate films. They are not numbered or considered parts of a larger whole. I guess I’ll have to go to that HK site and find out for myself. I think that the Nation and Destiny films are dramatizations of the lives of national heroes. Just to complicate things, the North Korean film industry likes to split individual stories into two or three parts each. If the Wikipedia entry is correct, Unsung Heroes is a twenty-part serial telling a continuous story with the same characters. Based on the clips that are on YouTube “Unsung Heroes” looks like the most insane film ever made: defectors as actors, incessant zooms, an oppressive airlessness, language difficulties, and slavish (occasionally stylish) imitations of Gordon Willis and “The Godfather.” By contrast, “Santantango” is light entertainment. BTW, I had trouble at the kmvc5 site. I’ve registered but can’t download. Do I “cash in” before downloading? Any advice? Yes, the site does require you to add cash before you can download. Bit strange but it works fine after that. I have a more detailed synopsis of the Unknown Heroes franchise which I will try to add to hopefully clear some things up. Hello once again, this is the fellow that originally contacted you! It appears that kmcv5 has been heavily updated and they are now taking translation orders! I just sent an email inquiring about the costs of this service and will get back to you guys soon. BTW, I have a few hundred dollars in my paypal account and wanted to know if there are any films that you are particularly interested in! There are so many choices, but I am leaning towards the Nation and Destiny films (only the first 13 or so are translated) which give interesting insight into the North Korean view of South Korea, and non-military films from the last 2 decades. Good luck and get back to me if you find anything interesting! As you may remember, Masao Kobayashi says that he owns the copyright and the film has only been shown once in North Korea. That definitely might be the next one I track down. thanks a lot for the link @ charles and @dprkfilms for making it public. Here’s an article with links to North Korean films with English subtitles, on top of KMVC5. The 우리민족끼리 (Uriminzokkiri/”Amongst Our People”) youtube page has a playlist for movies (https://www.youtube.com/user/uriminzokkiri/search?query=%EC%98%81%ED%99%94) and childrens’ cartoons (https://www.youtube.com/user/uriminzokkiri/search?query=%EC%95%84%EB%8F%99%EC%98%81%ED%99%94), but none with English subtitles. There’s also this website based in Japan: http://Elufa-tv.net. If anyone has the time to compare all these free services to KMVC5, let me know. The Playlist offered on piie.com is a good start(originally by the KFA USA), though it only has 5 movies. English subtitles are in the works for this series, if any of you are members of Karagarga.